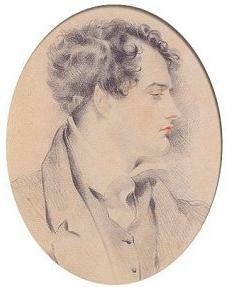 On October 19 1812, John Cam Hobhouse writes to Lord Byron after along silence between the two good friends. Hobhouse had received a brief note yesterday and today he responds. He writes of of the opening of Drury Lane and Byron`s Address. Hobhouse also mention`s France`s invasion of Russia: "Here are the French soundly beaten and taking their enemy’s capital. " We frequently, during the first months of our acquaintance dined together alone. . . . Though at times he would drink freely enough of claret, he still adhered to his system of abstinence in food. He appeared, indeed, to have conceived a notion that animal food has some peculiar influence on the character; and I remember one day, as I sat opposite to him, employed, I suppose, rather earnestly over a 'beef-steak,' after watching me for a few seconds, he said in a grave tone of inquiry, - 'Moore, don't you find eating beef-steak makes you ferocious?' "
Hobhouse`s letter to Byron is reproduced below. My dear Byron, It is completely out of my power to go down to Eywood, and, thanking Lady Oxford for her invitation, which is indeed very kind and pressing, I have been obliged to tell her Ladyship that I can not leave London. I have directed to Herefordshire but in case the letter should miscarry and you should go to Eywood pray have the kindness to say every thing proper for me on the occasion – I suppose you, by this time, know the Drury Lane adventure chapter and verse. The world is certainly bewitched. Conceiving you to be an incorrigible author I should not wonder if you gave all answer in the affirmative for that to which I replied in the negative – Not a line have I had from you for many many weeks until the receipt of your scrap yesterday. 1 Life, Letters, and Journals of Lord Byron, by Thomas Moore. New Edition. Murray 1860.